Not sure how things are where you live, but the rhubarb season has been a sad affair, with low yields and not that much to speak of in the markets. With a pound of sad little stalks at the ready this Saturday, I abandoned all plans of compotes and jams, and decided, on a twist of lemons into lemonade, to make cocktails out of stalks. This little drink is as delicate and lovely as it appears, but like so many things of beauty, packs a bit more of a wallop than you may have been expecting. Please reserve this experiment for the end of your day, when you have little else to do but sit on the porch and wonder how it is that you never noticed that you have a cowlick, or if a failing to water your blueberry bush is a form of moral turpitude. First, you’re cutting up your rhubarb, wondering precisely why it is you really need to use cheesecloth but doing so anyway and making yourself a sticky, delightful syrup that will freeze well for cocktails this winter. While that cooks down, consider dinner, because after one of these you may have only enough energy left to clumsily hack away at a hunk of nice cheese. This is a cocktail that works best with a mis en place situation, because there is much going on. Here is the part where you will ask me if you need rose water. I don’t think so. But if you do (or in my case, use rose syrup) it will make it a tiny bit more special. Place all your ingredients save the ice in the cocktail shaker as requested and shake it hard. Really do it for 30 seconds. Count if you have to. Then, you add your ice, which helps everything to really froth and get nice and cold. Shake some more. You may at this point realize why bartenders keep thick towels at the ready. Strain into a glass, preferably tiny and thin, like the tall one pictured, and top with soda. The drink is so lovely and pink and frothy it seems almost too sweet to mess with. Sip it slowly, taking in the late light of a summer evening. Think about ball gowns, and horse shows, and the things you thought you would be missing just sitting in the silence, which in fact is nothing at all. This looks delish, Ramos Fizz has always been my favorite, but this looks worth a try! 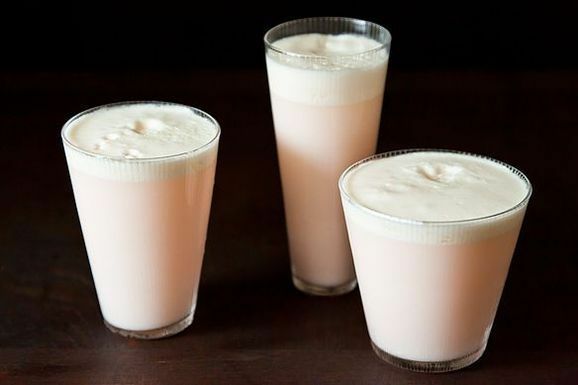 My favorite drink -- and now with rhubarb?! Swoon. Drool. This drink is such a surprise. The color suggests sweet and milky, yet the first sip proves it's tart and snappy instead. Loved it. Uhm...what? Forty-two ounces of rhubarb syrup? Geez! That was a typo on our end and it's fixed now -- thanks!